The ultimate competitor for Apple ipod has been officially unveiled and it is called Creative’s ZenVision W available in 30GB and 60GB variants. 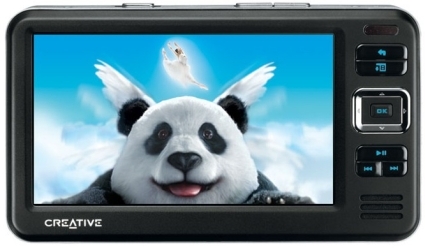 One of the main specialty of this player is that it sports 4.3-inch, 16:9 format, colour widescreen TFT display. The expected price of this player (30GB) is Singapore Dollar $649.00 (INR 17,523). View 480 x 272 resolution in a wide aspect screen at up to 262,144 colors in your videos. You’ll see crisp, clear details in every movie or photo, even under bright lighting. Big screen blockbusters, yesterday’s picnic, or even your favorite TV shows8. They can all fit in your pocket and are perfect for sharing. ZEN Vision W supports many video formats, such as AVI, DivX� 4 & 53, XviD4, MPEG-1, MPEG-2, MPEG4-SP, WMV9 and Motion-JPEG, which simply means more choices and fewer restrictions. View precious memories – tens of thousands of them – in 262,144 vivid colors in actual resolutions. Complete with a thumbnail gallery, ZEN Vision W makes it easy to scroll through your entire photo collection. Zoom in to close up preview of your new images in actual pixel resolution and decide if you really want them in your library. Perfect for taking with you on the road or anywhere. Set the tone as you like it with the 5-band custom EQ or 8 preset EQ settings. At up to 96dB signal-to-noise ratio, your music will sound as good as it looks. Connect the ZEN Vision W to a projector or TV with the bundled AV cable, and delight everyone with big screen movie magic delivered in true resolution. Transferring pictures from your camera to ZEN Vision W has never been easier. Simply slot in your camera’s Compact Flash (CF) memory card and lets ZEN Vision W do the rest. The optional Compact Flash card adapter supports all your favorite memory card formats such as SD, MMC, Memory Stick and more. Watching movie with your best mates on a picnic trip is now easier with the high gloss and scratch resistant wide color screen. Built in with a quality audio fidelity speaker, ZEN Vision W is the perfect pocket cinema. If 15,000 songs aren’t enough, listen to more music with the integrated FM radio. 32 station presets let you switch stations with ease. Store and view all the information that’s important to you – daily tasks, contact lists and even a calendar – that you sync with Microsoft Outlook, or edit with Creative Media Explorer. Meetings, lectures, even voice memos to yourself – record them all with the integrated voice recorder, which stores hundreds of hours worth of recordings. What Apple iPod does not have when compared to Creative ZenVision W? Native support for flash memory, TV out, FM Radio, external speaker and Voice Recorder. Inspite all this, I love Apple ipod for its simplicity and the great quality of hardware which Apple makes.